Nancy Laben is the Chief Legal Officer, Corporate Secretary and Executive Vice President of Booz Allen Hamilton. She leads the firm’s Law Department and is responsible for the company’s legal work including corporate governance, securities, government contracts, employment law, cyber law, intellectual property, commercial transactions, Mergers & Acquisitions and corporate investigations. She is a member of Booz Allen’s Leadership Team and also has oversight for the firm’s Media Relations, Government Relations, Ethics & Compliance and Social Impact. Laben is based at the firm’s McLean, VA headquarters. 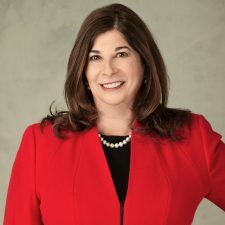 Before joining Booz Allen, she was the General Counsel at AECOM Technologies and prior to that served as Deputy General Counsel at Accenture where she held senior positions leading the legal work for Accenture’s US, Europe, and Asia business. Prior to Accenture, she served in the Law Department at IBM Corporation. Laben moved to Japan when she was 12 and has loved travel and the arts ever since. She holds a B.A. degree in Government and East Asian studies, with honors, from Smith College, and a J.D. degree from Columbia University School of Law. She serves on the Wolf Trap Foundation Board of Directors and the ABA Commission on Women in the Profession. She met her husband in evidence class at Columbia and has lived with him and their two children in New York, Hong Kong, London, Chicago and now the Washington D.C. area.